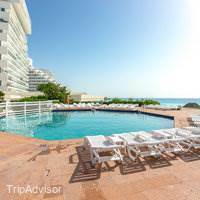 One of our top picks in Cancún. 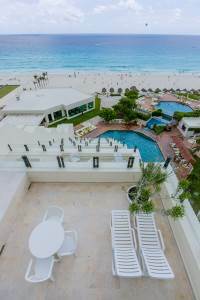 Surrounded by sand white beaches and the sparkling waters of Cancun, Mexico, this all-inclusive resort offers exceptional service and numerous recreational activities, an ideal location for the entire family. 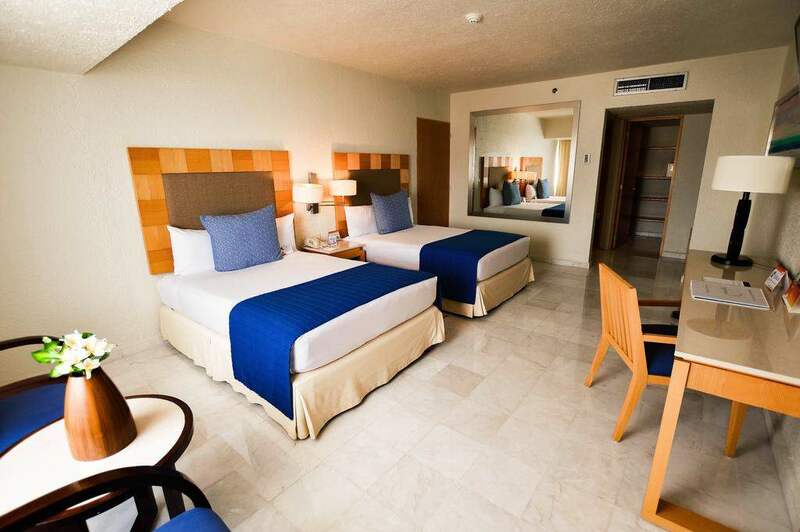 The Park Royal Cancun provides guests with everything needed for a relaxing holiday. With on-site spa services, a state-of-the-art fitness centre and endless leisure activities, there is something for everyone. Park Royal has been certified by the Department of Tourism with the H certification which is given to hotels that comply with high standard health procedures. 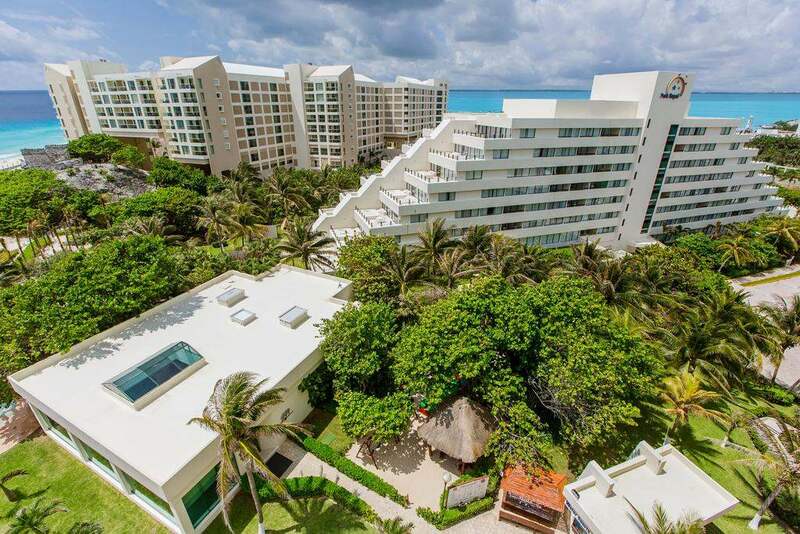 Guests at the Park Royal can enjoy a variety of water sports, including scuba diving, windsurfing and fishing only steps from the hotel's front doors. One of the area's largest shopping centres as well as entertainment options and a vibrant nightlife are nearby. Wonderful time. Royal Holiday people were great. Loved the new lounge chairs at upper pool. 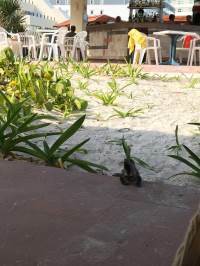 Did not care for the birds at upper pool area and restaurant. I would encourage the hotel post signs not to ffeed the birds. 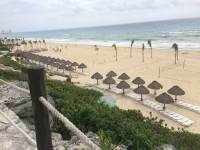 We visited this all inclusive resort for our friends birthday and did not have the best time. The first night we got in it was raining which is fine but the rooms were flooded because of the rain water coming through the glass doors, the same thing happened the next night as well. So basically for the first two nights we had rai water in our room. 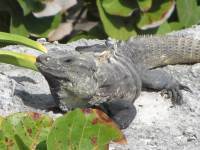 The term all-inclusive does not necessarily mean everything is included at this place. They charge for the gym, they charge to weigh your bags. Also in any inclusive resort I've stayed in they've stocked the fridge with beer and snacks at this inclusive they only stock water and anything else you want as far as snacks or drinks you have to buy. Also, if you want a late check-out they charge you $40 extra an hour. The food is very bland and only have one restaurant... which also is not very good. The only good thing is that the staff at the restaurant are are very friendly. 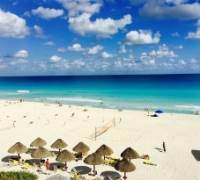 I spent 19 days @ the Park Royal Cancun. It's just like my second home. It's always clean, the employees are always friendly & helpful, & they go out of their way to make you feel welcomed & do everything in their power to make your stay enjoyable. . The food is awesome. Especially the breads & deserts, talk about guilty pleasures. 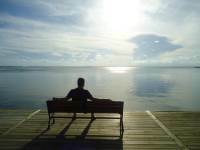 A wonderful place to relax, play & pray, truly a little peace of Paradise. 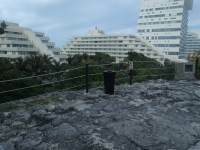 The magic of our own Mayan Ruins right on the complex. One of the most Beautiful stretches of Beach on the whole island & 2 of the best life guards ever. A wonderful experience that I would recommend to anyone who wants a break from the daily grind. 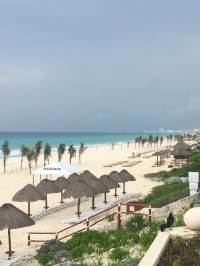 We stayed at the hotel with my daughter's gymnastics team, who were visiting Cancun for a competition.Terrible service at reception, very inefficient, first room we were given, was on 1st floor, really dark and overseeing some construction works at hotel garden, we had to keep room curtains drawn for privacy, not nice for a beach holiday. Kept us waiting for about 6 hours to give us a different room after we were asked to leave original room early, supposedly to accelerate the process. Housekeeping poor too, room had not been cleaned by 4.30 pm one day and by 2.30 pm one other day. Had to call to complain.Pool area crowded and with unnecessary loud music. Food at restaurant was not kid's friendly and options were very limited and the same every day.Room was spacious and comfortable, staff nice, great pool for kid's. I would never go back, all inclusive format is definitely not for me. nice rooms, nice personnel ready to do their best to serve you!! 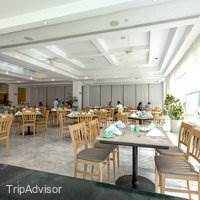 onsite there are just buffet and one good Italian restaurant, but because all inclusive price is not expensive, you can afford to go out and try many beautiful places just 5 to 10 min walking distance. Enjoyed every moment. The staff was excellent especially in the dining areas and bar. Our favorite Server was Gabrial in the Main dining area. He made us feel very special. Did not like the pressure you are put under when you first arrive though. If I want to purchase a plan I will do it on my own. 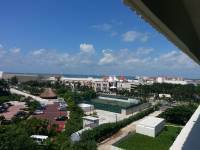 Park Royal Cancun was awesome yet again! We're already planning our next trip. Their hospitality is the best around!Special shout out to the activities staff, Benny, Denise, Angel, Luis and Arturo for making every night a party, and also to the bar tenders, Jorge, Arturo, Martin, Mario, and Benjamin for keeping the drinks cold and full!Muchos Gracias!! Great views and great location. Service is good and very family oriented. The rooms are big but older. We still were very comfortable even with a family of five. Bring slippers because the floors are cold in the room. Beware the timeshare salespersons. 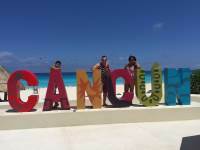 Cancun is now one of my favorite destinations. Thanks to all the hard working locals they are awome. We have paid and reserved a presidential suite and the first day they gave us the ambassadeurs suite because they didn't have any presidential suites available. The people from the front desk didn't have an answer for why they didn't respect the reservation and they told us we had to see it with the central offices by phone, but at that time it was already closed. I don't understand how an hotel like this doesn't have the respect of people at the moment they do not respect what you paid for. They didn't give any kind of damage control, so at the end we paid 3 nights in a presidential suite in which we stayed only two. The hotel staff was exceptional.....the Pam Royal staff was rude, and very poor customer service. Each time I approached the Park Royal desk, I was met with a blank stare, no smile, no greeting. I felt like they were being "put out" for having to address me. We had an early excursion, and the hotel wouldn't give my guests a box lunch. We received no itinerary of the weeks entertainment, no info about the spa, had no idea about the Independence Day celebration. The Park Royal staff was only interested in getting me to commit to a 90 minute sales presentation. They also harassed my guests each morning at 9:am, by calling their room. We arrived at the hotel at 3.30 pm. The operator of reservations, The Royal Holiday, changed our reserve and our suite without any previous contact. We haved reserved a presidential suite at the 09 of May, and the hotel gave us and studio suite at the 5th floor. In the superior floor the hotel its making a construction, so it's a terrible noice. They don't respect our reservation, our payment for a presidential suite which is more expensive, and we have to wait until 5 pm for a studio suite at a noisily floor. This hotel its nos recommended. We booked the hotel taxi a few days prior to visiting. 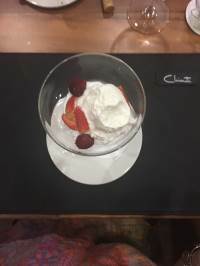 This was good value for money.Reception staff were friendly on arrival and Yazmin on the Club members desk was very friendly and helpful.The room was basic, clean and was a good size for all 4 of us. The is a pull down double bed in the lounge area, which was comfortable. Toiletries were available and towels were changed daily if you wished. A bit of a watch out, if you take straighteners, they won't work as the there is only 110 voltage plugs.Pool areas were good, with daily entertainment from the team. Pool towels are also available.The top pool is adults only, but they allow older children in there. Our children are 15 and we're allowed.Food in the buffet restaurant was good. 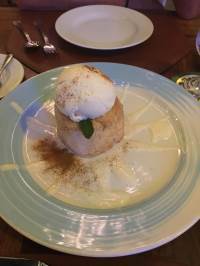 The only thing about it, is that there is limited food for children.Service in the restaurant was excellent.There is an Italian Restaurant also, which you can visit as many times as you wish. Food and service again were excellent. Long trousers are required for the men and have to wear closed shoes.The reception bar and seating areas are good. The service at the bar was very good. Very friendly. The only thing about the bar is that you have to drink out of plastic cups. 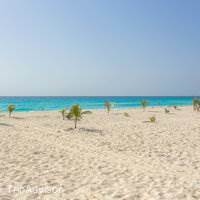 We couldn't see the reason for this as it's very far away from the pools.The beach is fantastic, white sand and turquoise sea... beautiful! Sun loungers are available for hotel guests. The staff that were outstanding with their service and I would like to mention some here, Mario and Almardo (lovely jubbley)at the Adult Pool. Luis and Manuel at the Reception Bar. Gabriel and Felix at the La Veranda Restaurant. At the Italian restaurant Fred, Pedro and Edwardo.Good clean and tidy hotel. 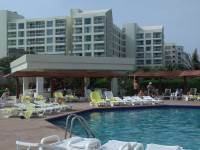 Park Royal Cancun has a nice facility with great waitresses, and staff. Nevertheless, when we heard noises coming from the bedroom upstairs and called guest services they didn't do anything. The noises continued all through the night. We heard hammers, nails falling to the floor, and the occasional dragging of wood. When we first told them our situation through the phone, they just said they would call security to deal with them. We called 3 times that night. It continued until 11pm, almost 12. Next day at 8am we heard the noises again, but we went about our day; when we got back to the resort to sleep at 4pm the noises, and dragging continued. I was pissed. Took my phone and recorded the situation and noises, and that's when they believed me. That's when they admitted they were working 8am-6pm (thats not what they said the night before when they called security to tell the "guest to stop"). When I opted to go to that floor see what was going on there I saw mattresses outside, and wood panels, too. I took pictures to show the lady that didn't believe me nor wanted to help me. They didn't change my room nor did the hammer ever stopped. That was just the situation on my room, but in the hotel they are expanding so theres another construction outside that is pretty noisy, too. The bars are supposed to open at 10am, but if it can be 10:20 and the first drink hasn't been served. The workers are nice, awesome, and very fast. 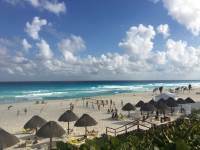 We enjoyed a 7-day stay at Park Royal Cancun. Our vacation was made even more pleasant by the wonderful service we received. At La Veranda restaurant, we wish to thank Hostesses Elendy and Lizeth, Manager Alfonso, and waiters Gabriel, Felix, and Marcial. Also, at the lobby bar, we wish to thank Luis and Alberto. Many thanks to everyone for making our vacation so wonderful! Describe the service you experienced: I experienced Wifi, room services and others. Everything was very organized.Tell us how you liked the room: Yes, a lot! This was very clean and organized.Talk about the location and amenities: I visited some places like Coco Bongo and Xcaret. I loved this experience.Say what you liked best and least: What I liked the most was the attention and hospitality. As for what I least liked, I have nothing to say. 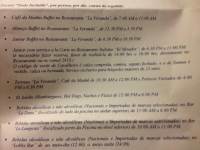 the check in took so much ... they gave me the room until 6:00 p.m. because they said they were in maintenance, but that´s not my problem.I reported I had a problema with the shower but had to call 4 times to be attended The TV had problerms and they never fixed it. 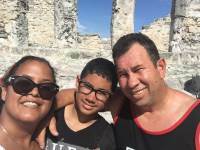 Vacationing at Park royal Cancun at the moment (family).The first impression of the hotel was average: smaller resort that what we are used toNot as many activities, especially for pre teens/teens. The water slides are good for younger children, the main pool is taken over by adult (in the afternoon)....don't know why they don't do the activities for adults in the adult only pool ( probably cause of the swim up bar)Average food: limited choices ( I always find something to eat, it is harder for my kids )Only one à la carte restaurant (but can not eat there since our kids are less than 12 years old).What made the experience good is the staff:- Front desk: Mauricio and Rocio de Leon changed our room when we asked for a different view (ocean view)- Carlos in the main restaurent made sure my children had something to eat on our first night (Mexican buffet, he had sandwiches made for them, thank you Carlos)- And this morning, I had my first good cappucino (Thank you Gabriel), I am not sure what they have been serving me the last 2 days.- The entertainment staff do try with what they have.- The hotel is mostly clean- Free Wifi: nice bonusFood wise: if u have picky eaters like I do: bacon and toast can be asked for, there is no breakfast sausage, there is no grill during main meal ( at least I haven't seen one), they have omelette station for breakfast.Snacks El Jardins serve burgers, hot dogs, nacho, pizza. No ice cream( would be a nice ad on).Movies, TV channels in English would be a nice ad on, especially on rainy days Like today.Would I come back? : i will answers this questions at the end of my vacation. 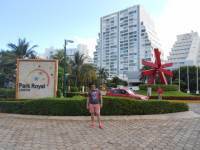 We just came back from a week-long trip at Park Royal in Cancun. Overall, it was a good experience. The best part of the hotel was the people that worked there. Everyone was nice and friendly. The people that cleaned the rooms did a great job. The food at the main restaurant was just ok, but we had the same servers for almost every meal, and they were always very friendly no matter how busy it was and was always very quick with our requests. 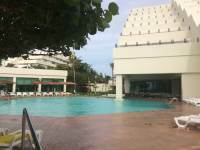 Limber Vasquez, Gabriel Mendicot, Marcrai, Danny and Miguel Balan, as well as Jorge who worked in the bar by the adult pool -- thank you so much for being so kind and making our trip so pleasant! Another thing I liked about the resort is a small collection of books by the pool towel service that guests are able to borrow and read. It worked for me since I finished reading everything I had. 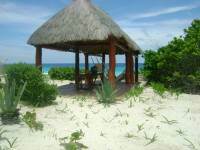 If you are just looking to relax, swim in the pool or beach, and just get away, this is a great place for it. A very good overall 2 week experience. Our room was ok but dated, We had a 2 bedroom suite with 2 double, hard beds and a dirty window ( did not open) which obscured the poor view of the next hotel, Very good internal hygiene and cleaned daily with fresh towels. All inclusive food was good with a `themed` evening dinner. Good variation, with swift waiter service, nothing special. The Italian restaurant was excellent. Unfortunately men had to wear long trousers, OK gives a better look but on holidays ! 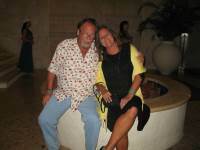 `Bermudas ` and collared shirt would have been suffice.Views from the adult pool bar were fantastic. 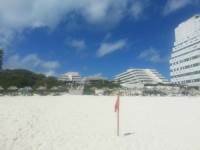 Good all round facilities and entertainment throughout the complex.The beach was beautiful with plenty of beds and shade. 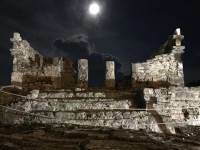 An ancient temple of the `mayan` is located directly beside the complex.Location is really good, close to the airport for transfer and large shopping complex, bank and pharmacy. Located close the public transport services for the entire peninsula.Although slightly negative, a really enjoyable and relaxing holiday.`WORTHY OF NOTING`What did make our experience at the hotel great was the `craic` and humour of the bar staff and the entertainment staff at all locations on site. The bar staff were brilliant, in particular Jorge, Armando, Arturo and Angel. Nothing was a problem to them and they could join in with conversation, keen to brush up on their language skills, while providing a great service. The entertainment staff Arnesto, Alexhandro and team always had time for you and encouraged participation throughout their days entertainment. Thanks guys for the company. Please ensure the guys are informed of their excellent service. when i checked in at 4pm room wasnt avaialble had to sit outside with babies in heat after being on a 3hr flight. thats the last thing we wanted to do after 30 min we went back to check if ready they said yes got a simple 2 bed room connecting another room which they were so loud and could hear them all night. next day we were leaving to go take my 5yr old to swim with dolphins that we had purchased at airport and they stoped us and promised us a better deal. we went back in so missed our transportation and he offered us a more expensive deal we couldnt afford. So for the next 3 hr my son was upset and crying for swimming with dolphins me and my husband went down to let them know we didnt appreciate what they did adn they didnt even apologize or care to. I spoke with the Gm Grisselda i believe n explained to her how they ruined our day n she said "ok" no sorry no nothing, so i just go across the street and take my son to the aquarium. The next day i come down i ask to print out boarding passes and they ask me if i went to presentation for timeshare i say no and she tells me she cant print it. i was amazed wow food is horrible there no welcome pack. no info on events for kids or times of food or pools closing just all around horrible stay away dont bring family here. Overall it was a very pleasant experience. Overall it was a very good experience. 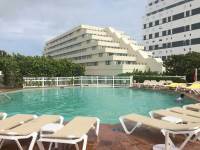 It's a relatively small hotel but with all the services and amenities that you should expect. 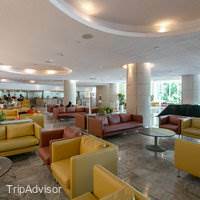 The service from the bars, restaurants, reception and concierge were excellent and unlike other experience from comments I read, I found every place to be super clean and smelled nice. I traveled for a week alone with my wife. I had a reservation on an executive suite although to my surprise it only had double beds since apparently the hotel caters mostly to families. 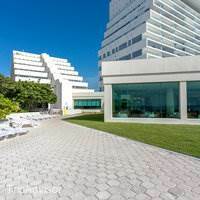 I requested to be changed to a suite with a king size bed on the main tower which was considered a downgrade for the hotel, yet turned out to be an upgrade for us since the room had the bed we wanted, the decoration was more modern, it was closer to all amenities and it had a view to the bay and the ocean. 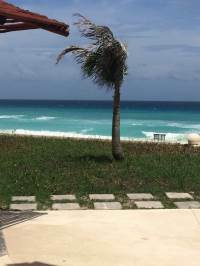 Rocio and Mauricio were super helpful at getting us this room promptly.FOOD: I guess that for what the all-inclusive cost, which is not much compared to other hotels in Cancun, the quality is good, but nothing really special. In the main restaurant I found the buffet is small and options limited. I wish they would've had a Taco Bar for lunch since as a tourist I rather eat Mexican food than Burgers and hotdogs. If you really want to get your money's worth make daily reservations at the Italian restaurant. We ate there 4 times and the food quality, options and service was really, really good. You won't get bored even if you eat there every night.LOCATION: It couldn't get any better. 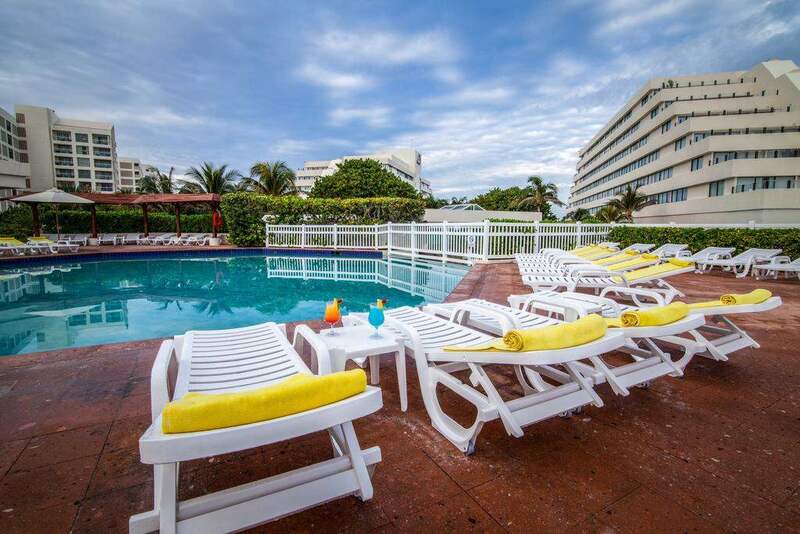 It's right in the middle of everything and walking distance from La Isla shopping center. The beach is also very nice and have plenty of chairs to rest.Since for us it was a couple's getaway we didn't fit with most of the crowd since most had children, although if we were to go back with our kids I wouldn't mind staying in this hotel again. Be aware. This place is more a 3 star hotel then a 4 star. Worth the read. Make sure you bring a long pair of pants if you want to eat at the Italian restaurant. No where do you find this information except in the reviews, (thank you tripadvisor reviewers). There is WiFi through out the property which was a pleasant surprise since it was supposed to be only available in the lobby and a charge if you wanted it in your suite. There is a mall just across the street 3 mins away. A pharmacy and bank directly across the street. The Italian restaurant is adults only, 12 yr and older. My nephew just made the requirements. 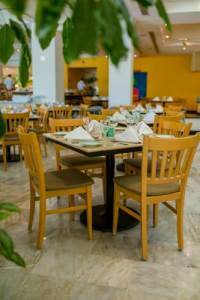 They boast 3 restaurants on the property but 1 needs long pants and open only for dinner(6pm-10.30pm)., 1 is just a snack bar- nachos, hot dogs, hamburgers, and pizza(12pm-6pm). And the buffet(7-11,12:30-3:30,6:30-10:30). I now understand the mixed reviews. Some are great others would not wish it on an enemy. It depends how long you stay and which day you arrive. The buffet is average and obviously to save money and not waste food they re imagine each meal with what was left from the previous one. First time I have ever heard of cold cut pate. The menu is a lot better at the beginning of the week. There seems to be fresh foods each meal but the choice is very narrow if you happen to be a picky eater. There are three pools on the property. 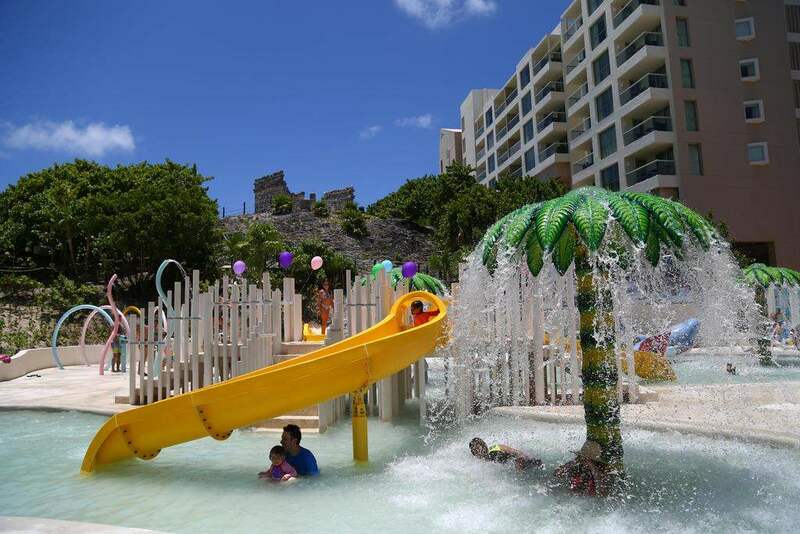 The kiddie pool is more of a splash pad with slides. It is behind the second building. You have to ask for directions. The all age pool has the swim up bar. There is an adult only pool no kids allowed. But they seem a bit flexible. We come out early and use the adult pool before it gets busy. If some one in your group is an early riser. Get your towels and save a pool chair in the shade most are gone by 8 am. There are lots of chair with beach umbrellas on the beach but you have to make a short trek to get drinks and eats. There is a gym available with a fee $6 USD/day. The staff is friendly and helpful. The bars are open 11am to 12midnight. You can get almost any drink but some may not be made correctly. My favourite drink long island ice tea was never made very well. You can tell them how you like your drink made that might help. The hotel was great in all senses! The rooms were clean, the food was great, and the personnel even more! The Chef Julio Olea was very friendly and aware of the dishes that were served. 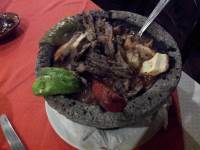 People like Gabriel Mendicuti and Uvaldo Pérez (waiters) were extremely friendly and resourceful! We purchased a membership a few years ago but this was our first use. Arrived and got a room that was 26.5 degrees. Air conditioner was not working well. But to their credit they came many times to fix but were unable to really fix the issue. Food was ok but sometimes looked worse than it tasted. Staff was friendly but the hot room was hard to get over. Be aware this is NOT a non-smoking hotel and the smell of the cigarettes will go into the next room as there's doors connecting you to the rooms. With that said, you can hear EVERYTHING!From the minute you walk into the hotel, the sales staff will try to make arrangements to sell you their timeshares. Non stop harassing. I even saw them going to people while they were in the pool with their family still trying to convince them to buy. They called our room and told us to pick up their "welcome package" which consisted of a bookmark and a guide to excursions. This is their way of trying to get you to schedule a meeting time to try to sell you the timeshares. One we picked up our "welcome package" they were relentless again. They want to schedule this during your breakfast or while you're waiting for your room (took 2 hours for ours to be ready). They claim this is a 90 minute presentation guaranteeing a big discount on excursions (it is) and a certificate of a 3 night stay at any of their resorts for free, it is not. You have to pay $200 to activate after 90 days.Now the room - no ventilations in the bathroom, family hotel but no tub only shower. If you need an iron / ironing board, you have to call and request and are limited to a two hour use and are required to put outside your door and call for pick up. If you need it everyday, you have to request it everyday. Minimal toiletries. One night woke up to use the bathroom and no water was running. When I called was told they had a pipe leaking and water had to be shut down. No mini fridge in the room nor any dresses. There's a rack in the closet. TV screen / viewing not great and mostly all Spanish channels. Beds are very hard and uncomfortable. Woke up every day with back pain.Please note, the gym is not free unless you have a membership. There's a $6 fee per day. There's only one restaurant and its a buffet. The food is not great, very bland and pretty much the same everyday. Breakfast does NOT include meats (sausage, patties, etc). If you want bacon, you have to request it. There's another restaurant (Italian)but it's only for adults and kids over 12. Needless to say, I couldn't go since my child was under 12. 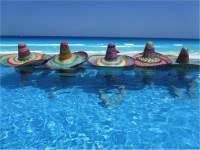 The drinks are just ok. By the pool is a snack bar, hot dogs and hamburgers, nachos, pizza, and condiments. The pools are small and not that clean. The waterpark has no lifeguard. The staff does try very hard to entertain and the music is good. Hotel offers day passes, expect high crowd on the weekends.I also tried to exchange money and was told they were in between shifts to come back later, I did and still got the same response. Came back a third time and was told they were waiting for the person who handles the money. I just stopped going. Also, there's no transfer to the hotel or airport, only to members and the fee is 100 pesos per person.The staff (not the sales crew) is great. Very attentive and friendly.I WILL NOT COME BACK! Best thing anout this resort is the staff. All were very professional and personable. Service is excellent and i was able to let loose and joke with the bar tenders. The ones i remember: Luis, Leo, Armando, Arturo and Alberto. The bad, only one restaurant that you can go eat without reservations, food kinda seems the same but cooked slightly different daily, a buffet. The nice one you have to make reservations which is ok but this being a family resort my whole group couldn't go in together because we had one child under 13 yrs of age. I was so upset i didnt even eat that night. 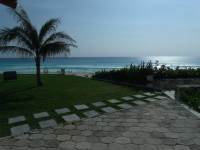 If i go back to Cancun i may not stay there again even though i am an associate of theirs. Also, would have been nice to have the fridge in the rooms stocked with drinks as i have had in other resorts. Oh, my rating is actually a 3 not 4 as this app did not let me change that once selected. This is an OK resort, the food options are very limited and the one restaurant requiring a reservation is mediocre at best. I got there early for my check in and was told that my room would be ready at a certain time and it wasn't. 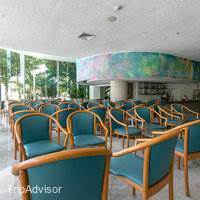 The people who work there are nice but it may time for this resort to get an upgrade it its appearance. 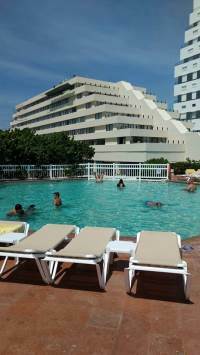 The rooms are spacious and the employees service was very good to excellent. I was in a group of 9 and almost no one enjoy the food, it was very bland. I cannot speak of the restaurants because we had kids in our group and restaurants were for those above 12 years old only. I suppose overall it was ok for what we paid. The beach is beautiful and location is good too. They recommended splitting our group to go to the restaurants but that is not the point of vacationing as a family group. 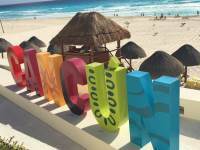 This is our first time in Cancun and we have a large group of family, relatives, and friends. My first look at this Park Royal when check in and dining was so disappointed since our family was split into two separated rooms and the dining buffet restaurant was so small and less food compared to our previous recently stay at other all inclusive resorts. However, the staff here are all so friendly and helpful; especially the restaurant manager, Mr. Alfonso. He is a nice, friendly, and professional manager I've ever met. When we brought to him that our kids have special needed and requested special cook, he was so nice and asked chefs to cook special foods for us. He made a nice little birthday cake and had staff sing birthday song for me as well; even though he just got know from my wife a few minutes ago. The hotel is a little small compared to other resorts around but the rooms are so clean and service staff are so friendly and nice. 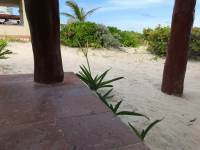 The landscaping is so beautiful with a lot of views of the beach and for family pictures. My stay here first day was so disappointed, but it turned out we were happy with the rest of the week. I would recommended other because Mr. Alfonso and his staff. We recently stayed in the second building of the Park Royal establishment. 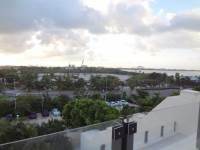 We were on the 3rd floor, anything below that has a slightly obstructed view of the ocean. I can not say enough praise about the cleanliness and pride the maintenance staff takes caring for every detail of caring for the grounds as well as building. The hotel staff were some of the most welcoming people I have ever experienced. We instantly felt at home. The food and drink service was top notch. Upon arrival we inquired about concerns with the water, we were patiently and accurately assured that all food and drink is prepared with bottled water. We tried almost all the food and nearly every drink, tequila included, and we did not have any health related issues. The food preparation staff was amazing, Chef Julio Oleo prepared top notch food. The selection of food was simply amazing and always fresh. The staff was always smiling and genuinely happy to greet you when they see you again. Irving Rodriquez, was a favorite smile to look forward to every morning. Finally in the formal dining area, waitor Erick, made every dinner special. He not only made us feel welcome but also became a part of the trip we look forward to daily. Alfonso was also a wonderful addition to our dinner experience. I highly recommend this hotel. The food and drink were top notch. The staff is even better. The building is impeccably clean at all times. I look forward to a return visit soon. The staff was really helpful and made us feel at home. Facilities were nice, with enjoyable spaces, but who made us feel at home were some of the waiters at the buffet who made us feel at home. Congratulations to Ever and Gregorio who even took some of their time to chat with the family and made us feel great. 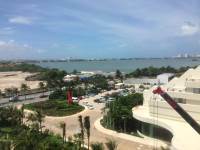 Oceanfront Hotel on hotel zone, Great Location! 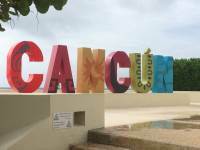 We have traveled to Cancun many years and stayed at this hotel at least 5x. 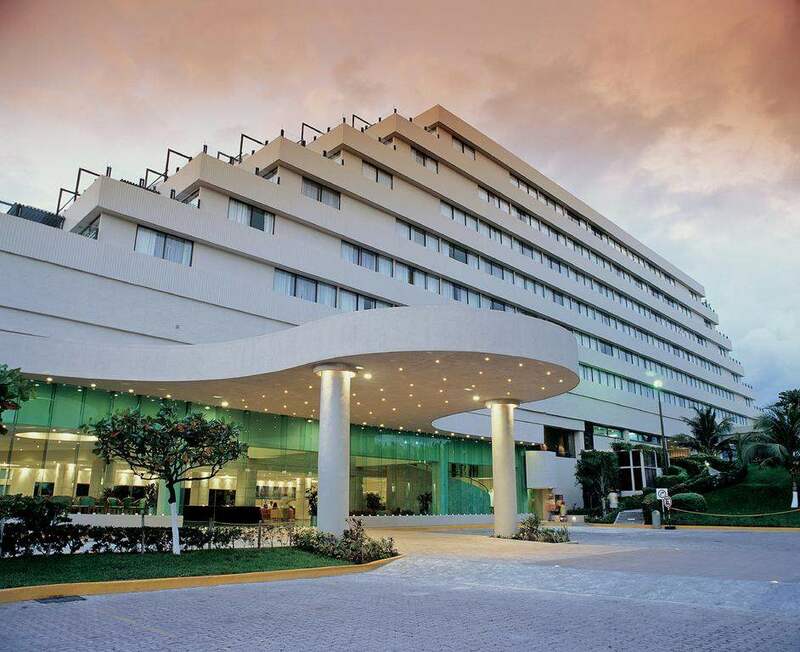 The reason we always return to this hotel is the location can't be beat, it is across the street from Isla Mall. The hotel is always clean, many different rooms to choose from within 2 buildings. 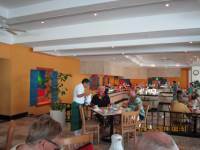 There is a main buffet that serves 3 meals a day with wide variety to choose from. There is an outside grill that serves hot dogs, burgers, chicken patties, nachos and pizza. One specialty restaurant (Italian) that requires reservations & Long pants for men, I believe closed shoes also. The staff are incredible, work very hard to please guests, keep hotel immaculate. 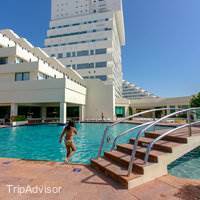 There are 2 pools, Main pool lower level which has entertainment staff, volley pool with swim up bar. 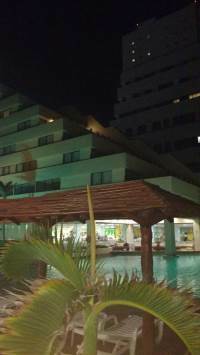 There is another pool upper level and also has a bar area with tables and chairs in a shaded area. There are also several hammocks up in this shade area behind bar to escape from the sun. There is an area for ceramic painting for all ages. There is a main bar in the lobby. There are scheduled trips with the entertainment staff at night. There are also time share staff here from timeshare company but if your not interested they will leave you alone. There are bathrooms along pool area if needed/ outside showers also. 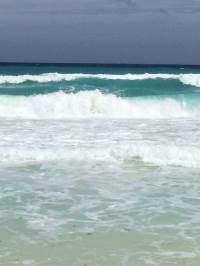 The ocean is beautiful as well as the sand. Good place to stay.....Couples, Families not to many singles here. Grand Park Royal is a much better resort but the staff at Park Royal was amazing. Everyone so gentle and nice. Some special names must be said: Williams from the Royal Team made sure I had a perfect birthday celebration and a nice comfortable staying; Felix, Carlos and Cornello from the restaurant were super kind and Jesus and Jake from the entertainment team made sure we had a great time outside the hotel! Very good staying! My wife and I go to Mexico on a regular basis. 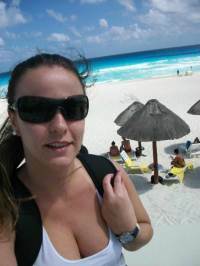 We have done Cancun, Cozumel, Playa Del Carmen... realistically, 25+ times.. she is 33, I am 34. Every year, we do 5+ days as an anniversary trip. This year, our trip was topped by two bartenders in the lobby bar, Luis and Manuel. Their level of professionalism and over the top service is unparalleled. When the bed you sleep in doesn't matter, this is the type of experience you look forward to waking up and going to bed to.. my hat is off to the company that hired these two guys. What a way to make us feel special. Typically I would refrain from writing any negative reviews since I believe that people only take the time to write when it is negative and not positive experiences. But as a result of my resent stay at this resort I feel almost obligated to inform any potential tourist coming to this place to avoid this particular resort.My number one and most annoying complain that I have is the fact that this was our first time as members visiting the resort and we get approached by a sales team member trying to up sale us our membership! This person kept pressuring us to attend a 60 minute presentation to upgrade our membership…..He was promising free gifts, which one of them was free WiFi and the WiFi was included. What made me so upset with this individual was that he did not take the time to give us a tour of the facility nor explain to us how the check in and check out process works. Like how many restaurants or pools they have. The hours of the restaurants, how we needed key cards to get pool towels and we needed to return then or we would be charged for them, or the fact that you must check out at the front desk so that they can cut your bracelet or again they charge you $50 per bracelet. This guy did give us information about what a big mistake we had made getting this membership. Like the fact that we were told lies!!! Like the fact that we are not ever going to be able to stay at the Grand Park Royal because we do not have the higher membership….The hotel needs some TLC….rooms are big, we did get a presidential suite. I was told that all presidential suites are ocean view. They are not!!! The Jacuzzi was nasty. We had to clean it before getting in there. The showers were horrible. Every time we took a shower there was water everywhere. The shower curtain was missing a lot of hooks and the AC in the bedroom did not work well. The hallways smelled of a mildew smell and something else. Not a good impression. The refrigerator in the room was a decent size but the freezer portion did not work. We bought ice cream and it melted.All the people at the bar and the restaurants were super nice. Our room was always nicely cleaned and they left plenty of towels for our group. The front desk agents were super rude. Enrique on the morning shift gave me the run around about getting the room that I was promised. I just gave up but I did find all of them very rude and kinda of stuck up, like they were doing you a favor or something. The beach is very nice however I did find it kind of odd that they did not have pool service or beach service. You could not take any food to your room either.My back still hurts from that hard mattress. The other thing they should consider is stop pressuring guests to become members after they declined. So many lies, so disappointed about our membership and so not worth the money. The location of the hotel is nice but I would never go back. The food was not very good. The food at the snack bar was much better.Overall I will not go back to this place. I did like the friendliness of the restaurant people and the bar people. The cleaning lady was great and the location was great. Other then that it was bad. I made the most of it but at the end we decided it was just a place to sleep and shower. We decided to do other things and spend more money then expected since the place did not offer anything and the food was terrible. The bed is hard but the rooms are beautiful and clean. The buffet is good for breakfast and lunch but the dinner at the buffet is awful. Make a reservation for the Italian restaurant because that is the only good dinner. ALL of the workers there are absolutely amazing and kind! That was the best food I had at the resort. The people at the front desk are nice but they tell you something and then go back on their word. At the end we were able to solve the issue of purchasing a Mexican family member a day pass but they made us wait until the last day without saying if they would have space until the very last second. Regardless its great if its for a few days but for a whole week its best to go with a bigger resort. 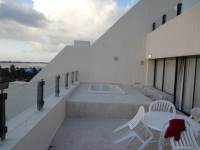 The location is wonderful because its right across La Isla mall which is very cute and close to Kukulcan Plaza. 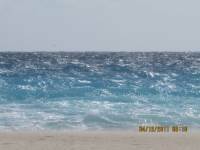 The beach is also very beautiful. I was really disappointed with this hotel. Upon arriving, I had to wait over two hours before a room was ready. I was immediately approached by a "consierge" but I knew something was up with that. This person kept pressuring me to attend a presentation for a time-share type of membership. I politely declined several times. After finally entering the room, the disappointment grew. We realized there is no refrigerator in the room, the beds were hard as concrete and the tv did not work. After requesting the tv to be fixed, they immediately sent someone but it was still very bad picture quality. We also realized they don't even offer room service and the rooms don't have irons or ironing boards ( had to request one). There is absolutely zero entertainment in the resort so we went to bed early every night. 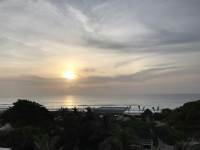 On the positive side, the food is good, the beach is beautiful and the location is within close proximity to shopping and public transportation. The staff is friendly once you start tipping. Overall, we could have gotten better service for ou money. My back still hurts from that hard mattress. The other thing they should consider is stop pressuring guests to become members after they declined. I was constantly bothered with that day after day. 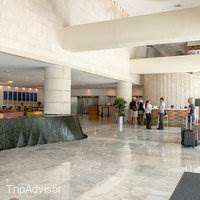 I loved the hotel, the staff was very friendly and helpful all the time. The rooms were very nice and the facilities very good. The restaurant had really good food with many options, including vegetarian options for people like me. Let's not forget Mario my favorite barman, who was always with a smile at the quiosque by the pool, making some delicious mixed drinks. First it is important to know there is a BIG difference between the Park Royal and the GRAND Park Royal. The Park Royal has 1 Italian Restaurant and a Buffet "Cafeteria" Restaurant. The food at the buffet was really good but the atmosphere is loud and chaotic. The waiters are awesome and will get you whatever you need (and then some). The Italian Restaurant is difficult to book for some reason and usually half empty. You have to make a reservation during certain hours. Why don't they take walk-ins? The guy at the door is rude and the dress code is ridiculous. Women are okay with flip flops, jean shorts and tank tops but men need long sleeve shirts and pants. We arrived on Fathers Day and were successful in making dinner reservations for the 8 of us. My 12 year old son was wearing khacki shorts, a button down and nice shoes. We were turned away due to the dress code. I get it. There's a dress code. But it was Fathers Day. There was plenty of space. And the guy was unapologetic. Other nights we missed the reservation window, they were full, etc. 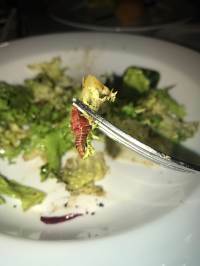 This was a major let down especially since it is your only other option if you don't want to eat at the buffet - every meal, every day.We bought pants for my son and made reservations for our last night. When we arrived for dinner, we were told they didn't have our reservation. Once again he turned us away even though there was space. I actually took a picture of the half empty restaurant. We walked to the front desk at the lobby and complained to the manager. She then called him and arranged for us to be seated. It was the same guy at the door every night. Looking back, maybe we should have tried slipping him a couple of bucks - shouldnt of had to. Honestly the food in the Italian restaurant isn't any better than the buffet. It's just a much nicer atmosphere with a violinist and a beautiful view of the water. 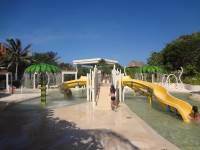 Our group of 23 family & friends included 11 children ranging in age from 1-15yrs so I chose this resort based on many family friendly reviews and the pictures of the water park. My review is based on MY experience only and no one else in my group. After our trip was paid for and I continued to read reviews, I started to get concerned about many things. One thing I see a lot of complaints about is check in and I saw no issue with this. We arrived at 10am and they held our luggage, gave us our bracelets and let us start enjoying the resort and none of this took longer than any other resort I've been to. We were told to come back at 5pm for our rooms and got our keys then.I had a presidential suite and my room was everything I could have hoped it would be. I was so very happy to have an ocean view and not a lagoon view. My biggest issue with the room is that there is no dressers/drawers to store your clothes, only shelves in the closets that really didn't hold much and with 5 people in our room, I really didn't feel like hanging all those clothes while on vacation. I really have no opinion about the food. I know this is important to many but for us it is not. 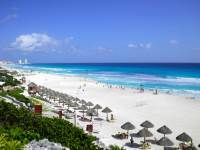 We spend our money to enjoy Cancun and will always find something wherever we stay to keep us happy. The best and most meals for us were eaten at the burger hut next to baby pool; burgers, hot dogs, nachos and all the fixings you could possibly want on any of that! The buffet was awesome for breakfast and I was never able to attend the Italian restaurant because we had kids under 12. 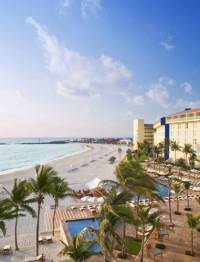 The pools were great and so was the water park and the beach was great as well. In summary, I found this resort to be a very nice, family friendly place. I didn't particularly care for the fact that there is no pool or beach service BUT I worked with it and took my own cooler bag of waters and beer to the beach with us, so once again not a major issue but it was definitely something I prefer. I also like to have room service available for times when the kids are cranky and it's just easier to dine in especially in that beautiful suite but this wasn't an option and they don't stock your mini fridge with beverages, only 2 bottles of water per day. 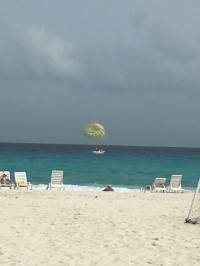 The location is one of the best and the resort is very clean and service from ALL employees, including front desk was top notch in my opinion. I would definitely not rule out this resort for a future stay but am going to try something else next year. I highly recommend this resort for families that are not high maintenance. 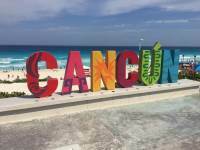 Being my first time in Cancun, I decided to stay there. I was very impressed with how welcoming and helpful the employers are. In the reception, there was a receptionist named Yazmin, she was very helpful, answered all my questions. If she's helping you, you're in good hands. In terms of the room, I really like how they clean the room everyday. 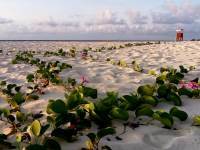 The beach access is also great, very clean and amazing sand. The food was very good and they had a big selection. I definitely recommend this great hotel to anybody! 2nd Rate Room but Otherwise Great Facilities! Disappointed with the service at the resort for couple reasons. 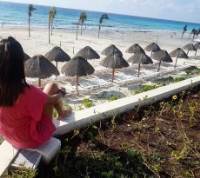 First, requested a car seat when my daughter and her family arrive at Cancun for transportation to the resort. I verified the day before and I was confirmed in writing the van will have a car seat. Guess what? No car seat. Being proactive I checked them in before they arrived to the resort. I verified a crib would be in the room. This was done at 9am. After multiple follow ups it took them till 6pm to bring the crib. While my grandson was sleeping the crib collapsed. It frighten him. He is alright. Waiting for a replacement. How long will it take? This is my 6th stay at this resort. 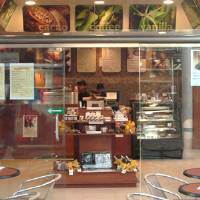 The service is terrific and the staff is very friendly. They keep it spotless. The few changes I noticed this time: The sausage and bacon are not out in the breakfast buffet, but your waiter will be happy to get them for you (probably reduces waste which is passed on to everyone). There were never were many organized activities, but there were even fewer this time around. These few things had almost no negative effect on our pleasant stay. I stayed there before and I will continue to stay as I upgraded my membership. the service is excellent very polite personal. food is very good bar drinks, pools the beach is all very nice. I will definitely recommend this place to my friends and relatives.